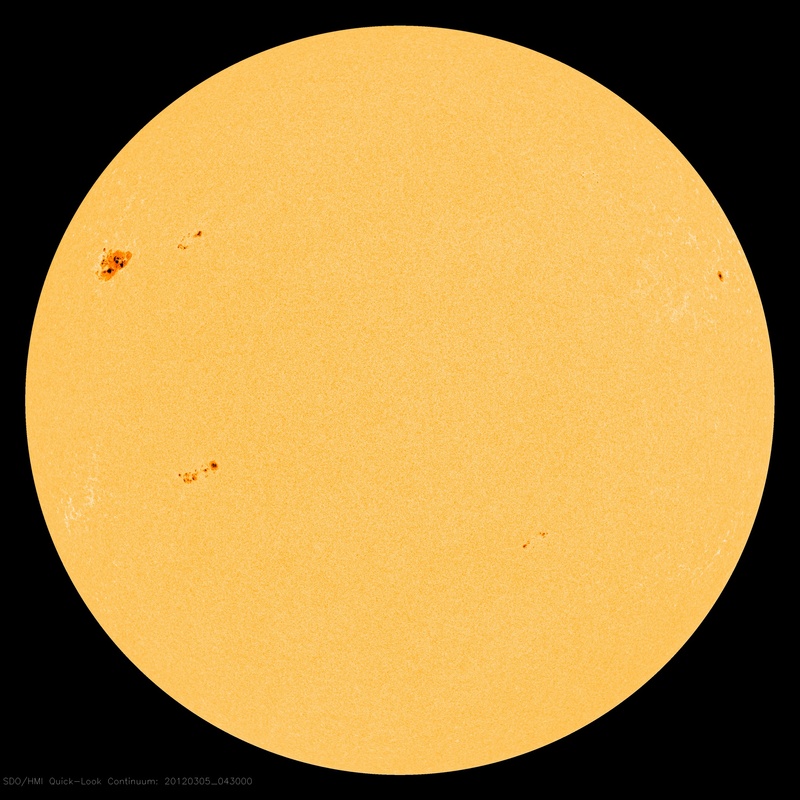 As the Sun approaches solar maximum this year and next, sunspots will grow more frequent and numerous. Those tangled knots of magnetic activity will bring more frequent solar flares, coronal mass ejections, and plenty of radio disturbances that affect technology on Earth. The rise in the Sun’s activity also increases the odds of seeing auroras at high latitudes and, occasionally, middle latitudes. The images above come from NASA’s Solar Dynamics Observatory, which constantly images our nearest star in high-definition detail. 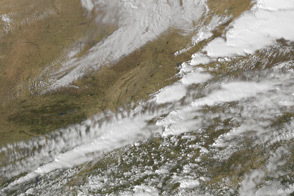 The top image, from the Helioseismic and Magnetic Imager (HMI), was taken at 04:30 Universal Time (11:30 U.S. Eastern Time) on March 5, 2012. 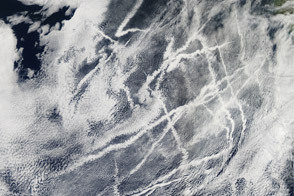 The bottom image was captured by the Atmospheric Imaging Assembly (AIA) just a minute before the HMI image. 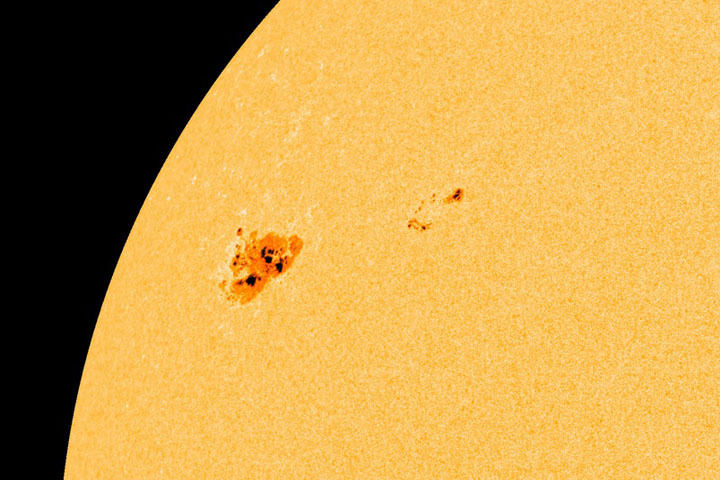 Both images show different faces of solar active region 1429, which rotated around the limb and into Earth's view on March 2, 2012. The top view shows an approximation of the Sun's surface; the area with black spots surrounded by deep orange is a sunspot region, a place where magnetic energy is extremely intense but the surface is dimmer (and slightly cooler) in visible wavelengths. The bottom image shows the same area in extreme ultraviolet wavelengths (171 Angstroms); the sunspot region appears brighter in UV, radio, and other parts of the electromagnetic spectrum. 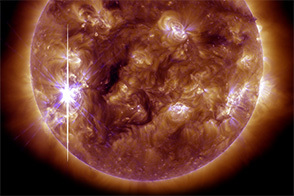 Looping lines reveal solar plasma that is rising and falling along magnetic field lines in the solar atmosphere, or corona. 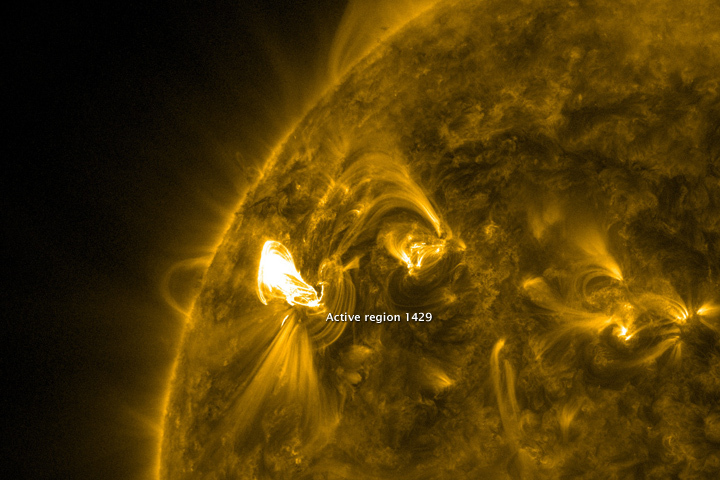 By midday on March 6, active region 1429 had released at least four M-class and one X-class solar flare. 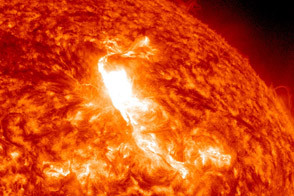 Large explosions of solar plasma—known as coronal mass ejections—accompanied many of the flares. The region also emitted several radio bursts that can interfere with radio communications on Earth, particularly on high-frequency (HF) channels. 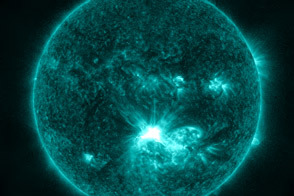 According to the joint NOAA and U.S. Air Force Space Weather Prediction Center, active region 1429 was still growing as it rotated across the Earth-facing side of the Sun as was likely to produce more flares this week. 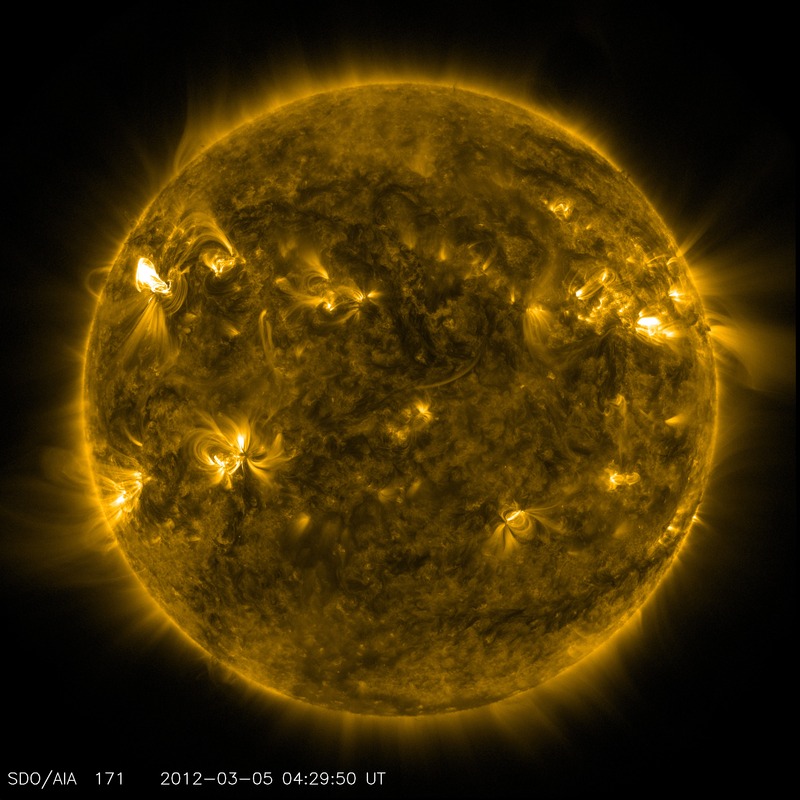 Images by NASA/SDO/HMI (top) and NASA/SDO/AIA (bottom). Caption by Mike Carlowicz. Solar activity creates radio noise on Earth and increases the chances of auroras.